Visiting from Miami, Gustavo Matamoros and Rene Barge perform Chapel, an evening-length immersive composition for 6 channels, akin to the sonic explorations they create (along with David Dunn) in the context of Frozen Music Ensemble presentations. The sound world will consist of recorded sounds manufactured by the duo through the manipulation of objects at Audiotheque’s sound studio. It will also contain processed and virgin outdoor recordings made in Miami for this event as well as electronically generated sounds intended to highlight otherwise inaudible acoustical features found in the performance space. 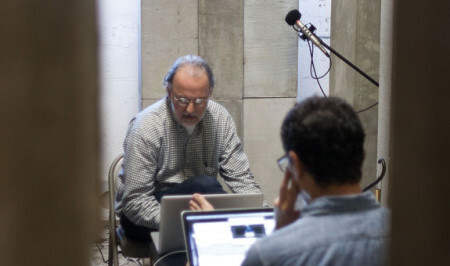 Working in multiple media, Rene Barge produces sound works, prints and videos. These are prismatic relays of the patterns he perceives around him. In each work lies the traces of complex orderings of distortions and filters. As records they simultaneously reflect multiple aspects of change at once, analogous to post-studio, post-digital cubism. Gustavo Matamoros is a composer-sound artist who creates and curates listening experiences in Miami since the mid 1980s. His current art and curatorial projects include Listening Gallery, Subtropics 23 and Audiotheque.